There are two words that once spoken, can almost immediately create a mental block and unwillingness like no other: Cold Call! Why is it that these words are anathema to so many in the sales profession? To some, it’s a trivial exercise that’s one of those steps they’d just rather avoid. To others, it’s a stripping away of their security blankets, exposing their self-doubt for all to see. Chris Beall, the Rockstar CEO from ConnectandSell.com doesn’t see it that way. 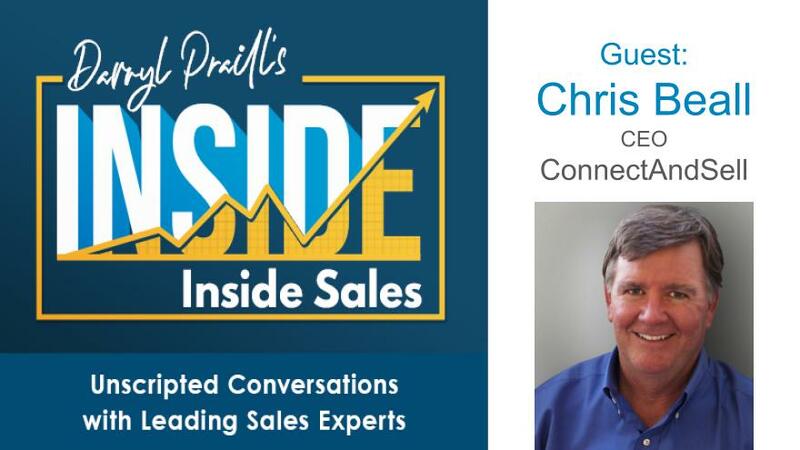 On this episode of INSIDE Inside Sales, Chris forensically disassembles cold calls and shows us how to take advantage of the interruptions they can create. He’ll also guide us into how we can use cold calls as an amazing tool for working with our prospects towards solving shared problems and eventually making that sale! Chris has been participating in software start-ups as a founder or at a very early stage for most of the past 30 years. His focus has consistently been on creating and taking to market simple products that can be used successfully the first time they are touched, without taking a course or reading a manual. His belief is that the most powerful part of any software system is the human being that we inappropriately call a “user”, and that the value key in software is to let the computer do what it does well (go fast without getting bored) in order to free up human potential. Do You Have a Mindset for Success? Prospecting VS Selling — Are you the master of either?